Come on sing it with me!!! Did you like the remake of The Sound of Music? Can you tell I did?! Today’s giveaway is a few of my favorite things. I love making candy, especially caramel. When ever I am in the mood to try a new candy recipe I always reference Elizabeth’s site SugarHero.com or her countless candy recipes on About.com. 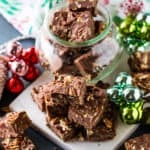 am Her book, The Sweet Book of Candy Making is full of recipes for toffee, hard candy, caramels, marshmallows and so much more. 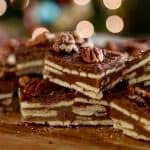 Not only is it chock full of recipes, but it provides a ton of techniques to perfect candy making! 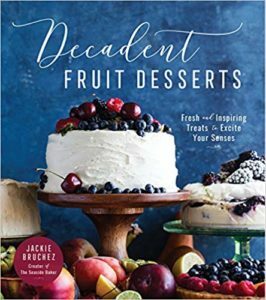 This book is a must have for candy makers! The next thing in this giveaway is 6 FREE coupons for Plugrá European Style Butter. This is THE ONLY butter you should be using for candy making (or baking in general in my opinion). 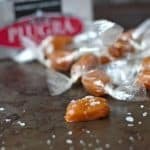 Trust me, I have compared other butters in this caramel recipe and the results never compares to the Plugrá batch. 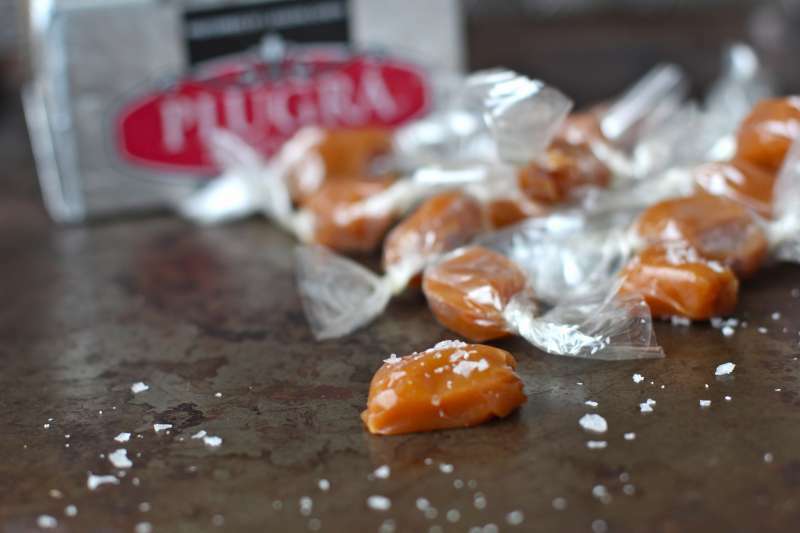 Without fail, every batch that has Plugrá European Style Butter results in creamy, soft perfect caramels. Finally, we are giving away a Maverick Digital Oil & Candy Thermometer . I have had mine for about 5 years now. In thermometer terms, that’s a lifetime! I never have to worry about this thing shattering in the pan (yes that has happened to me!) and is accurate every time! 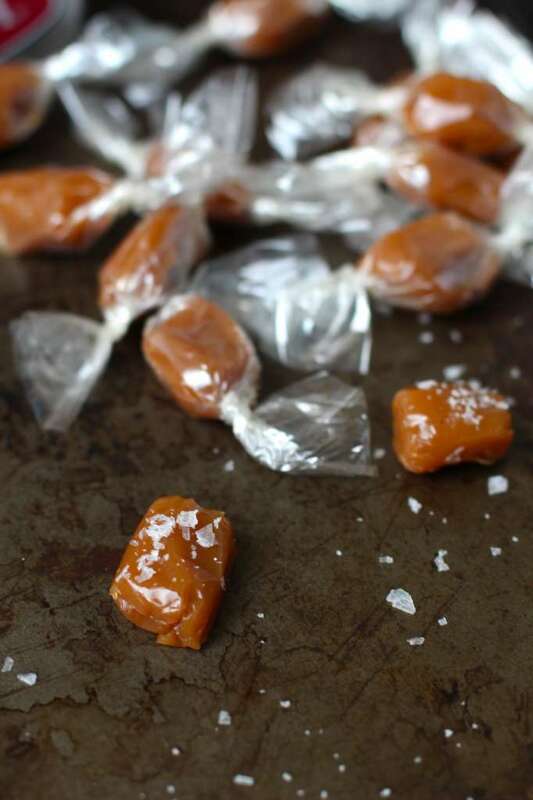 If you plan on making homemade gifts this year, I highly suggest making these caramels. 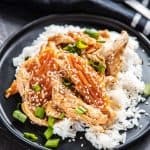 Unlike most recipes where you have to stand over the stove for hours stirring, this recipe is quick (compared to most recipes), only needs a stir here and there (at the end it needs a bit more attention), and the results are out of this world. 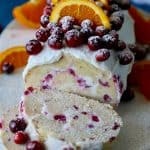 Make sure to add the sea salt flakes while wrapping because this really takes them over the top. The recipe makes about 150 wrapped caramels, perfect for pretty little bags for neighbors, friends and teachers. 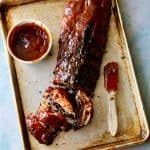 Generously grease a large 9x13 inch glass dish or jelly roll pan with non-stick cooking spray. In a large heavy bottomed TALL pot, combine brown sugar, cream, corn syrup and butter. Cook at medium heat until you candy thermometer reaches 250 (hard ball stage) degrees, stirring frequently. When caramel gets to about 240 degrees you are going to need to stir constantly, but it will only be for about 5 minutes until it reaches 250 degrees. Once caramel has reached hard ball stage, remove from heat and add vanilla, and salt, stir a few more times to combine. CAREFULLY pour caramel into greased pan. Let sit and cool for 3 hours. 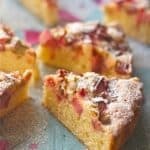 Cut into small squares and sprinkle with sea salt flakes. 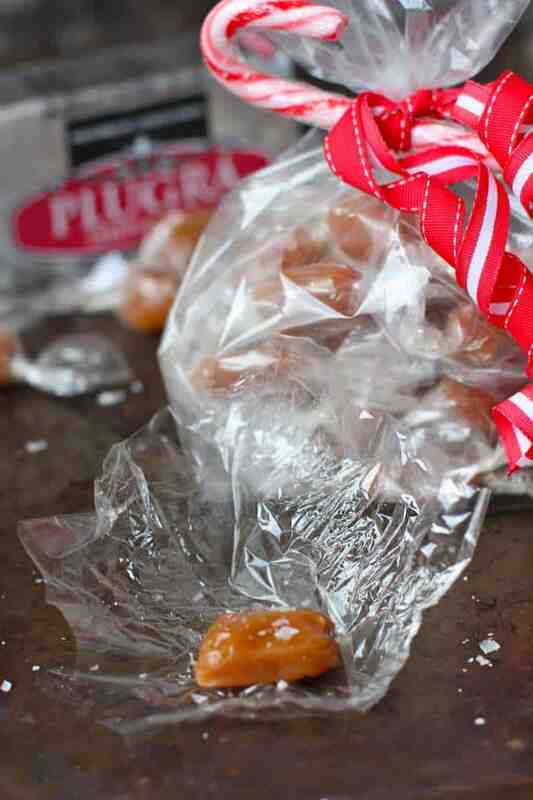 Wrap in wax paper or clear caramel wrappers. 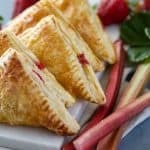 my mouth waters at this delicious recipe. Cant wait to try it! Thanks! My favorite type of candy is hard candy in fruit flavors. Another great contest. Thanks!! And the pics of the caramels look awesome!! And my fav candy? Anything with chocolate. I have a weakness for Mallow Cups! I can hardly wait to make these caramels!!! Sea Salted dark chocolate bar! Gray Sea Salt Dark Caramels made with agave. My favorite kind of candy is peanut butter cups. But I also love anything with nuts or sea salt. I love caramels. And truffles. And peppermints….. I may have a small problem (1) with sugar and (2) with making decisions:-) These look gorgeous and are definitely going onto my candy list for this year! Salted caramels are definitely my favorite! 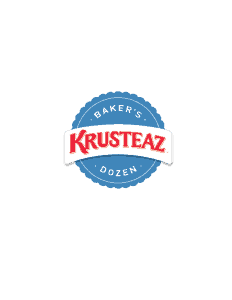 And I’m not just saying that because you made ones that are making my mouth water – they’re my weakness! It’s so awesome of you to give away a copy of my book–thank you! The rest of the stuff looks lovely as well–I’ll definitely be sharing this on my social pages. Thanks! I used to love anything fruity and chewy but lately it seems I’ve been craving more and more chocolate. I want to win. 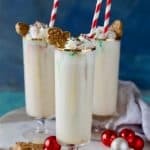 I make candy to give for Christmas every year. I like peppermint hard candies. My favorite candy is Seas English Toffee Nuggets! My favorite type of candy is milk chocolate with caramel. Picking one favorite is hard! I love most anything that contains chocolate! Rocky Road ice cream is my all time favorite!! Pralines are my favorite type of candy. 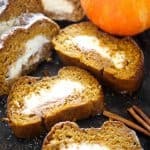 looks yummy and easy and love your holiday spirit but the remake was AWEFUL,never mess with a good thing! Question — the recipe calls for the European butter and shows a picture of unsalted butter. The recipe didn’t specify whether to use salted or unsalted. My understanding when cooking is to use salted unless a recipe specifically states unsalted. So my question of course is — does the recipe use salted or unsalted butter?